Wow...Christmas 2012, it's here already!! Where did the time go? Did you get everything on your wish list? I know my sons did!! My oldest just turned 16 on the 23rd and my middle baby turned 3 on Friday! It is a very expensive month for us, but what are you going to do. Since my little one loves to count, I made good use of our challenge over at SweetStamps. Sweet and simple right?!?! I LOVE it and so did my little one. I have seen these candles being made, so I thought it would be a perfect time to try. I know it's not anything over technical, but the simplicity of it is what intrigues me more than anything. Since I do try to CAS every now and then. 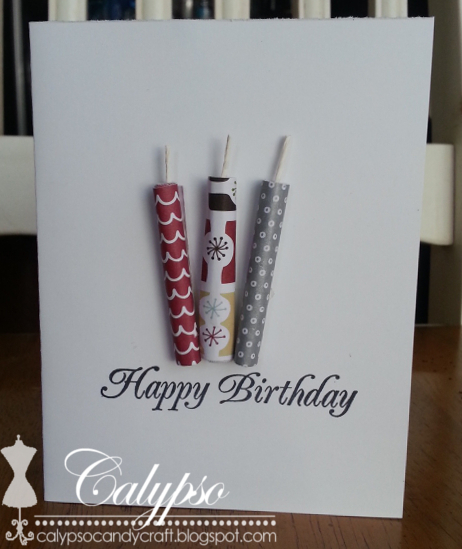 I used American Craft: MerryMint paper to create the candles. I cut strips of 2x4 paper, placed a piece of 1/2" Super Sticky Adhesive on the inside of the paper I did not want to show. Snipped a piece of embroidery and began to roll. This this until all three candles were completed. I used more Super Sticky Adhesive to hold down the candles where I wanted them to stay. Inked up my Happy Birthday Script sentiment with Memento Tuxedo Ink and DONE!! Adorable, happy birthday to your children and happy holidays. I love this fun idea- and CAS it is!!! Hope you have a Merry Christmas and enjoy all of the Dec. Birthdays! CAS can be more challenging than any other card - at least it is for me. I love what you did with yours, those candles are adorable and I will be making them myself. I'd never seen them before, but you look at them and then you have to do a head slap for not thinking of it before. Happy birthday to your boys. Thanks for joining us at Tuesday Morning Sketches. What a fun and pretty card!! Really neat rolled candles! Very fun and so simple!! Very cute CAS card. Thanks for playing along with us this week at Tuesday Morning Sketches. I really do love this card and want to give it a try! Thank you for joining us this week at Tuesday Morning Sketches for our special challenge, "Anything Goes"! WOW!!! Fantastic CAS card!! One that I definitely will be stealing the idea for since I too have quite a few birthdays in Dec and Jan!!! Happy New Year and blessings for a healthy and prosperous 2013! Love your sweet and simple design. Unique idea for the candles.